* It is important to note that there has been a 68 year “quiet period” in the San Francisco Bay Region. 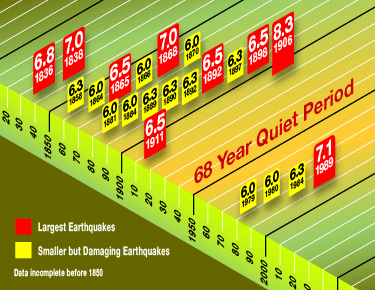 The period from 1911 to 1979 experienced no earthquakes over magnitude 6.0. It is also during this time period that the region experienced it’s greatest population growth. One way to determine the likelihood of future large earthquakes is to study the past frequency of such earthquakes. Since 1836, there have been five earthquakes in the San Francisco Bay Area with a magnitude of 6.75 or higher. If earthquakes struck randomly over time, the region would expect another earthquake of this same magnitude in the next 30 years with about a 50 percent probability. But scientists know that earthquakes do not always occur randomly over time. In some regions, such as the Bay Area, large earthquakes are more frequent at some times than others. An example of this clustering can be seen in the timeline above: there were 18 earthquakes of magnitude 6 or larger in the Bay Area during the 75 years between 1836 and 1911; yet there were no events of this magnitude during the 68 years between 1911 and 1979. Apparently, the amount of movement during the great San Francisco earthquake of 1906 was large enough to reduce strain throughout the region, so that only one large earthquake followed. Since 1979, however, there have been four earthquakes of magnitude 6 or greater, leading up to the recent 7.1 Loma Prieta earthquake. It seems likely that in 1979 we began a new era of major earthquake activity similar to the era before 1911. Geologists are now concerned that the strain along the faults has built up again and that more large earthquakes are possible. 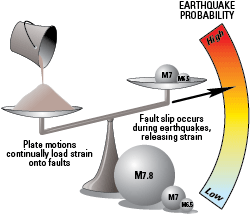 If the level of earthquake activity during the next few decades is similar to activity between 1836 and 1911, then the probability of a magnitude 7 earthquake in the next 30 years is about 75 percent. What Can We Expect in the Next 30 Years?